For a future Georgia outdoorsman's complete Hunter Education experience, we suggest an educational approach that involves participation on three levels. We feel that when an individual is immersed in all three levels of Hunter Education, it produces a safer, more responsible and more ethical future hunter. Basic Hunter Education provides the basic knowledge required for a potential hunter to receive Hunter Education certification and eventually purchase a hunting license. Basic Hunter Education classes are conducted by DNR staff, volunteer instructors or as a part of a school or extension service program. A portion of the Basic Hunter Education class may be completed online, followed by a review and exam. Depending on location and facilities, some classes may include a live-fire component. To build upon concepts taught during the Basic Hunter Education class, sharpen skills through competitive activities under the direction of coaches and volunteers. Many local groups, clubs and schools offer skill-building opportunities or youth programs. Georgia DNR administers or organizes several competitive programs that challenge the skills of emerging hunters. Examples include the National Archery in the Schools Program (NASP), Give it a Shot Program and the Scholastic Clay Target Program (SCTP). A natural progression leads to the hunter's first hunt. Hunt and Learns offer young hunters and their parent/mentor the opportunity to take part in a planned hunt. Hunt and Learns are organized and supervised by DNR staff, volunteers or carefully-chosen outfitters. The goal of a Hunt and Learn is to provide a safe, positive first-time hunting experience while improving hunting skills and conservation knowledge. 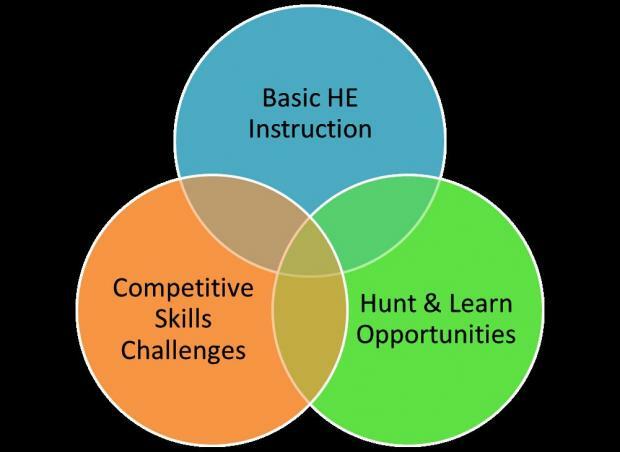 There is overlap in the knowledge and skills gained in Basic Hunter Education, Competitive Skills Challenges and Hunt and Learn Programs. A hunter who participates in only part of our programs will benefit only from the knowledge gained from that program. Should that same hunter take the entire program, they will experience the greatest concentration of learning. In order to produce safe, ethical future hunters, we must explore any opportunity to involve young people in a complete Hunter Development Program.